"BE THE CANDLE LIGHT OR THE MIRROR THAT REFLECTS IT"
Feel free to click on any of the links below. If you feel that another resource should be included on this list, please contact us at asap.club@nyu.edu. A few members of ASAP with Dr. Patrick Love at the annual NYU Student Affairs Conference. 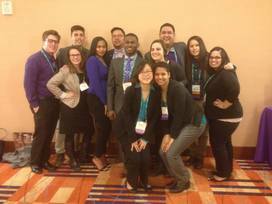 NYU HESA Students at the 2014 NASPA National Conference in Baltimore, MD.